The party is deeply rooted in the political culture of Greece. When some seventy members of the neo-Nazi organization Golden Dawn go on trial sometime this spring, there will be more than street thugs and fascist ideologues in the dock. A tangled web of influence is likely to engulf Greece’s police, national security agency, wealthy oligarchs and mainstream political parties. While Golden Dawn—with its Holocaust denial, its swastikas and its Hitler salutes—looks like it might inhabit the fringe, in fact the organization has roots deep in the heart of Greece’s political culture. Golden Dawn’s penchant for violence is what led to the charge that it is a criminal organization. It is accused of several murders, as well as attacks on immigrants, leftists and trade unionists. Raids have uncovered weapon caches. Investigators have also turned up information suggesting that the organization is closely tied to wealthy shipping owners, as well as the National Intelligence Service (EYP) and municipal police departments. Several lawyers associated with two victims of violence by party members—a 27-year-old Pakistani immigrant stabbed to death last year and an Afghan immigrant stabbed in 2011—charge that a high-level EYP official responsible for surveillance of Golden Dawn has links to the organization. The revelations forced Dimos Kouzilos, director of EYP’s third counter-intelligence division, to resign last September. There were several warning flags about Kouzilos when he was appointed to head the intelligence division by right-wing New Democracy Prime Minister Antonis Samaras. Kouzilos is a relative of a Golden Dawn Parliament member, who is the party’s connection to the shipping industry. Kouzilos is also close to a group of police officers in Nikea, who are currently under investigation for ties to Golden Dawn. Investigators charge that the Nikea police refused to take complaints from refugees and immigrants beaten by party members, and the police chief, Dimitris Giovandis, tipped off Golden Dawn about surveillance of the party. In handing over the results of their investigation, the lawyers said, “We believe that this information provides an overview of the long-term penetration and activities of the Nazi criminal gang with the EYP and the police.” A report by the Office of Internal Investigation documents 130 cases in which Golden Dawn worked with police. It should hardly come as a surprise that there are close ties between the extreme right and Greek security forces. The current left-right split goes back to 1944, when the British tried to drive out the Communist Party—the backbone of the Greek resistance movement against the Nazi occupation. The split eventually led to the 1946-49 civil war, when Communists and leftists fought royalists and former German collaborationists for power. However, the West saw the civil war through the eyes of the then-budding Cold War, and, at Britain’s request, the United States pitched in on the side of the right to defeat the left. In the process of that intervention—then called the Truman Doctrine—US intelligence services established close ties with the Greek military. Those ties continued over the years that followed and were tightened once Greece joined NATO in 1952. The charge that the United States encouraged the 1967 fascist coup against the Greek government has never been proven, but many of the colonels who initiated the overthrow had close ties to the CIA and the US military. Golden Dawn was founded by some of the key people who ruled during the 1967-74 junta, and Greek dictator Georgios Papadopoulos, the leader of the colonels who led the 1967 coup, groomed the party’s founder and current leader, Nikos Michaloliakos. Papadopoulos was a Nazi collaborator and served with the German “security battalions” that executed 130,000 Greek civilians during World War II. Papadopoulos was trained by the US Army and recruited by the CIA. Indeed, he was the first CIA asset to govern a European country. Golden Dawn’s adherence to Hitler, the symbols of Nazism and the “Führer principle”—investing the party’s leader with absolute authority—is, in part, what has gotten the organization into trouble. According to an investigation by Greek Supreme Court Deputy Prosecutor Haralambos Vourliotis, Golden Dawn is split into two wings, a political wing responsible for the party’s legal face and an operational wing for “carrying out attacks on those deemed enemies of the party.” Michaloliakos oversees both wings. Prosecutors will try to demonstrate that attacks and murders are not just the actions of individuals who happen to be members of Golden Dawn, because independent actions are a contradiction to the Führer principle. Many of the attacks have featured leading members of Golden Dawn and, on occasion, members of Parliament. Indeed, since the leadership and core of the party were jailed last September, attacks on non-Greeks and leftists have fallen off. There is a cozy relationship between Golden Dawn and some business people as well, with the party serving as sort of a “Thugs-R-Us” organization. Investigators charge that shortly after two party MPs visited the shipyards at Piraeus, a Golden Dawn gang attacked Communists who were supporting union workers. Golden Dawn also tried to set up a company union that would have resulted in lower pay and fewer benefits for shipyard workers. In return, shipping owners donated 240,000 euros to Golden Dawn. Investigators charge that the party also raises funds through protection rackets, money laundering and blackmail. Journalist Dimitris Psarras, who has researched and written about Golden Dawn for decades, argues that the party is successful not because it plays on the economic crisis, but because for years the government—both socialists and conservatives—mainstream parties and the justice system have turned a blind eye to Golden Dawn’s growing use of force after the economic crisis began. It was the murder of Greek anti-fascist rapper/poet Pavlos Fyssas that forced the authorities to finally move against the organization. Killing North Africans was one thing, killing a Greek quite another. Instead of challenging Golden Dawn in the last election, the New Democracy Party railed against “Marxists,” “communists” and—pulling a page from the 1946-49 civil war—“bandits.” Even the center parties, like the Greek Socialist Party (PASOK) and the new Potami Party, condemned both “left and right,” as though the two were equivalent. That certainly was the case in last year’s European parliamentary elections, when center and right parties in France and Great Britain refused to challenge the racism and Islamophobia of right-wing parties, only to see the latter make strong showings. According to the Supreme Court’s Vourliotis, Golden Dawn believes that “those who do not belong to the popular community of the race are subhuman. In this category belong foreign immigrants, Roma, those who disagree with their ideas and even people with mental problems.” The party dismisses the Holocaust: “There were no crematoria, it’s a lie. Or gas chambers,” Michaloliakos said in a 2012 national TV interview. Some 60,000 members of Greece’s Jewish population were transported to and murdered in the death camps during World War II. The trial is scheduled for April 20 but might delayed. 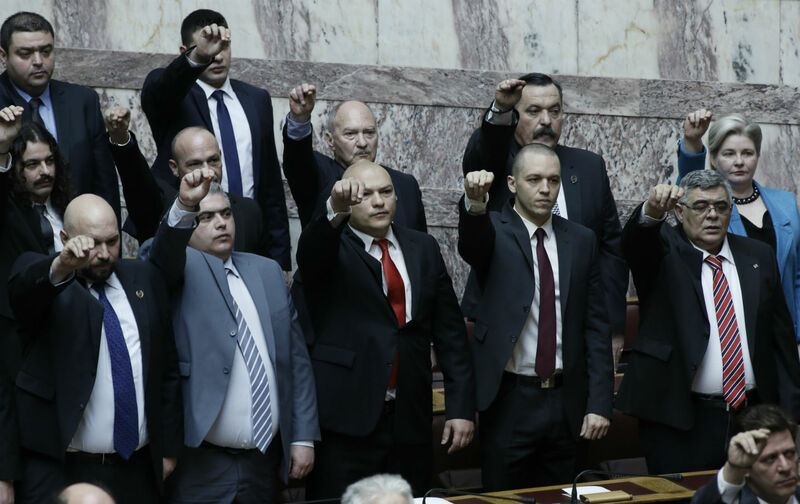 Golden Dawn members, including Michaloliakos and many members of Parliament, were released March 18 because they can only be held for eighteen months in pre-trial detention. The party, with its ties in the business community and its “wink of the eye” relationship to New Democracy—that mainstream center-right party apparently printed Golden Dawn’s election brochures—has considerable resources to fight the charges. Golden Dawn has hired more than 100 attorneys. If convicted, Golden Dawn members could face up to twenty years in prison, but there is not a great deal of faith among the anti-fascist forces in the justice system. The courts have remained mute in the face of Golden Dawn’s increased use of violence in recent years, and some magistrates have been accused of being sympathetic to the organization. The party is charged with being a criminal organization, with murder, assault and illegal weapons possession under Article 187. But courts are political entities and respond to popular movements. Anti-fascists are calling on the Greeks and the international community to stay in the streets and demand that Golden Dawn be brought to justice. Germans missed that opportunity with the Nazi Party and paid a terrible price for it. Editor’s note: This article has been corrected from the original, which mischaracterized the law under which Golden Dawn is being prosecuted.